i finally finished and properly (sort of) photographed a couple of things started at craft camp. 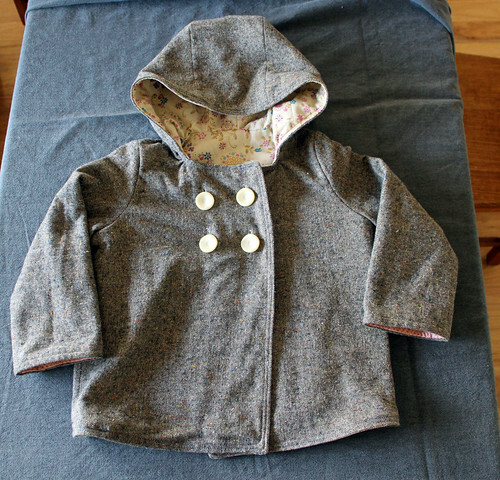 mae's coat, the same pattern as the denim version i made, except in a size 5. the size 3 fits her well but is a bit snug over a long sleeve plus hoodie, especially as i lined it with flannel. so i decided to make another but the size 4 didn't seem all that much bigger on paper so i went for the size 5 which is, of course, too big for her. but it will fit next year and possibly even the winter after that and it most definitely fits over a hoodie. i used a great tweedy wool i had stashed away and lined it with a lecien print, with flannel inbetween the layers again for warmth - except that i didn't have quite enough of the lining fabric so i used a different print for the sleeves. i didn't think you would even be able to see it but i have been rolling her sleeves up and it actually looks pretty cute with the two fabrics peeking out. 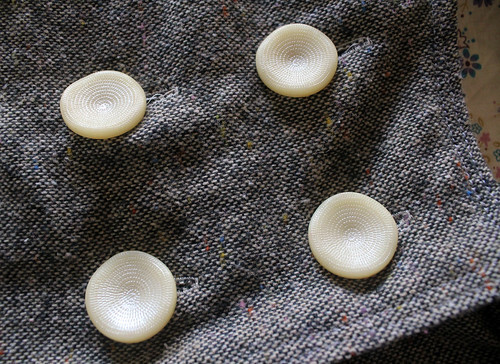 the vintage buttons might be my favourite part. and i actually got the placement of them right this time, the denim jacket's are a bit wonky. and for my sophie girl, i made this sweet little rompery outfit in a nani iro double gauze. it's sort of a birthday present for her and i chose the fabric since i made her baby blanket from a similar nani iro print (plus it is amazingly beautiful, of course). the pattern is from the latest issue of ottobre (03/2011) and i'm hoping she'll get some good wear out of it in canadian summer this august. should be pretty cute with tights and a long sleeve underneath this spring, too, really. GAH they are too adorable! The mismatched lining is fun though. And great idea of adding flannel for extra warmth.. I have a hoodie pattern to make for my girl which I haven't started yet so will do that. Both the coat and the romper are so nice. i love them both. I have that nani iro print but only a 1/2 yard and have not figured out what to make with it yet. gorgeous! I love the mismatched lining! wow!! 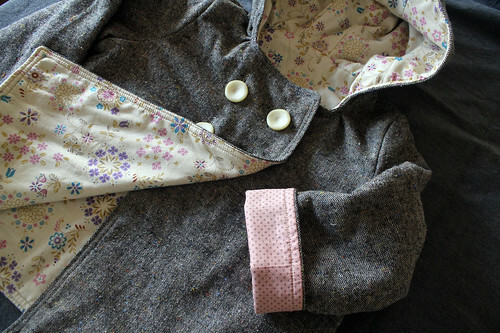 love that sweet little coat, just beautiful fabrics! 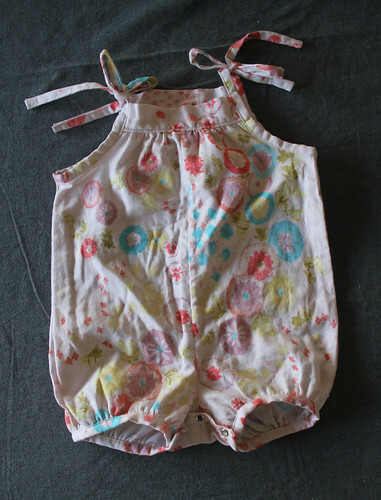 and the little romper, looks so cozy.